Super easy drop-in encryption for users of existing social media platforms. Hermes in action side-by-side with actual data sent over the wire. Increasing data collection by government agencies and social media networks has encouraged us to implement better privacy without forcing people to switch to a new platform and sacrificing their existing social circles. 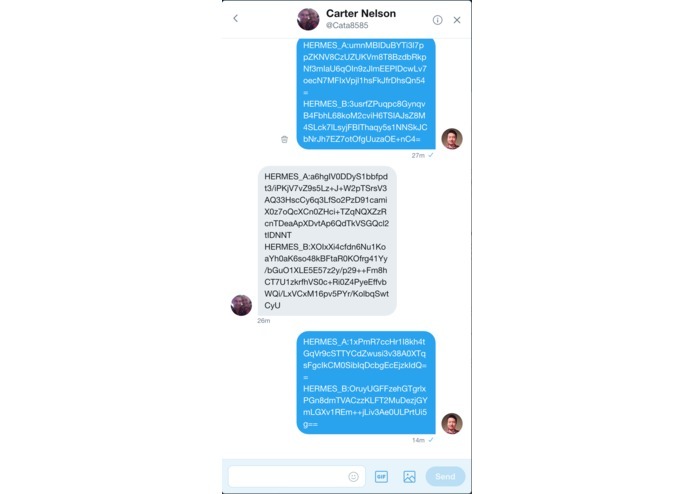 Hermes is a super simple drop-in solution for encryption of direct messages on social network platforms. No knowledge of cryptography whatsoever is required. For those who are interested, Hermes uses TweetNacl for elliptic-curve Diffie-Hellman implemented through Curve25519, with XSalsa20 as a stream cipher, and Poly1305 as a one-time authenticator. 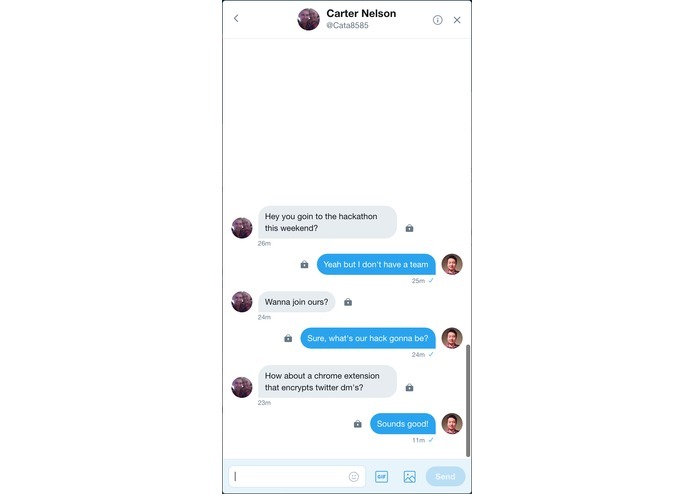 Having successfully reverse engineered Twitter's front-end JS to the point where we can successfully and confidently intercept direct message events before they're sent over the wire was an accomplishment that we're very proud of. As we've said, this took a huge amount of time, totaling to over twelve hours spent on experimentation and reiteration to bring us to the point we are now. We plan to expand Hermes to other social media platforms, which brings us the challenge of reverse-engineering each platform as we plan to support them. 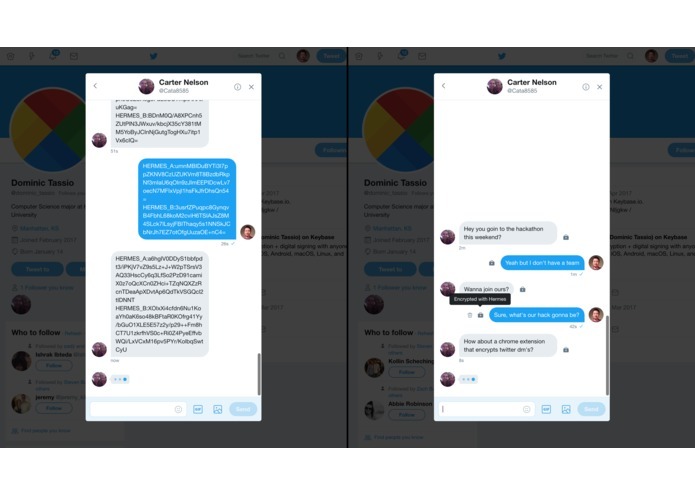 Reverse-engineering of Twitter, Twitter interface for our Chrome extension, the TweetNacl cryptography interface, and icons and graphics. I wrote the foundation for the Chrome extension, configured a VM instance on Google Cloud Platform where the flask server is running with NGINX providing a reverse proxy, improved Carter's initial API to access the database, Configured the domain used , wrote code to store and retrieve the public and secret keys, and created the initial extension user interface. Setup flask endpoints and sqlite database for storing unique user identifiers and public keys. Setup the digital ocean server to run the flask microservice on.